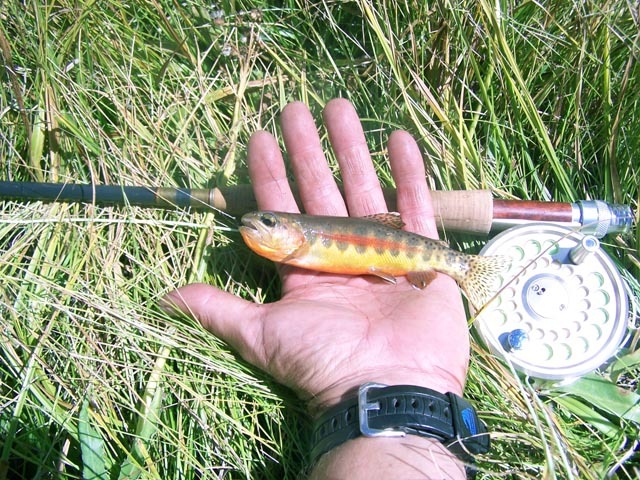 There are three subspecies of native Golden trout found in the waters of Kern River and its tributaries in the southern Sierra Nevada. 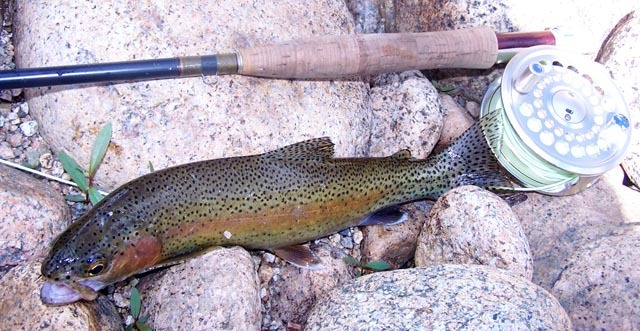 They are the Little Kern Golden--Onchorynchus mykiss whitei, the Golden Trout Creek Golden--O. m. aguabonita, and the Kern River Rainbow, O. m. gilberti. 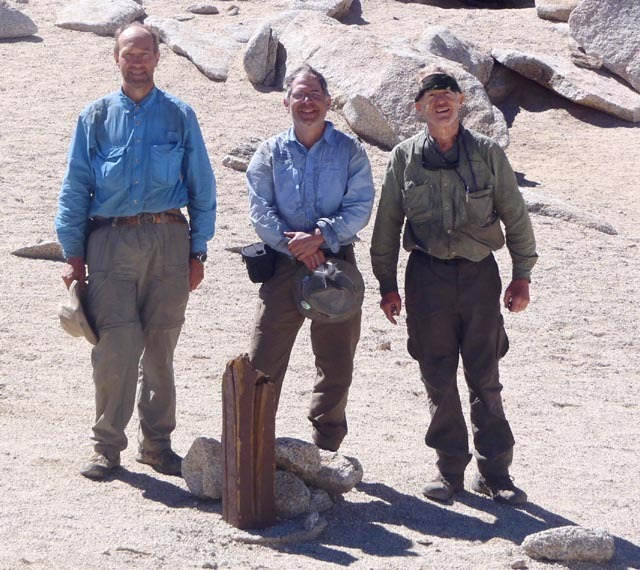 I had entertained the idea of trying to catch all three on one trip through these watersheds. A look at topographic maps of the area showed this would not be easy. 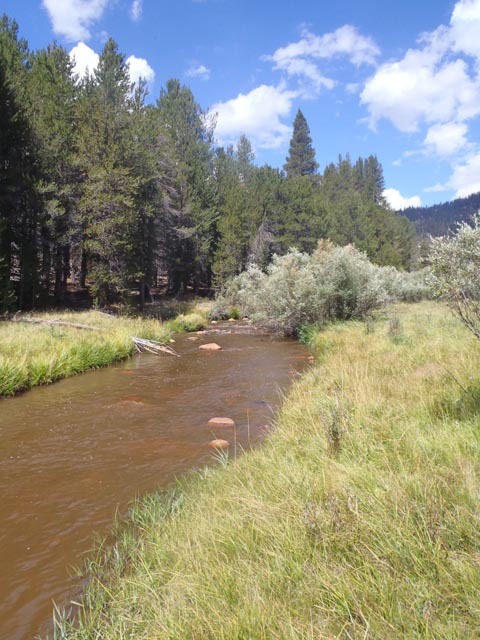 The part of the Little Kern River that was in reasonable proximity to the other waters was on the opposite side of the Great Western Divide from the others. This is a north-south running range of peaks towering to eleven or twelve thousand feet over the Kern River running at 6500 feet below them along their east side. The participants were Gary Trott, Rocky Ferraro and myself. We started from Mineral King, an alpine valley on the south side of Sequoia National Park. 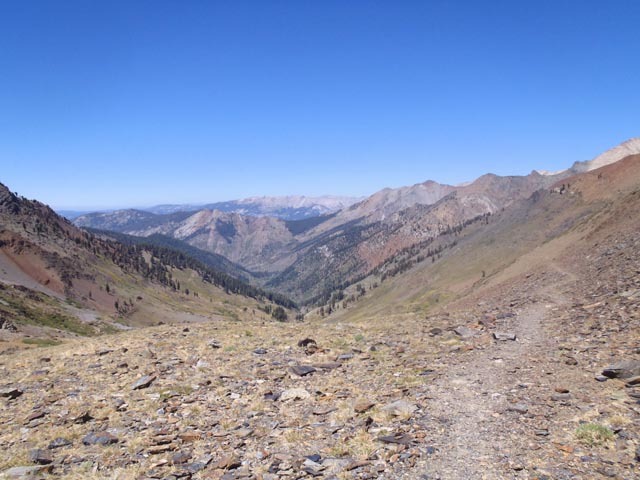 The route, starting at 7800' went south up and over Farewell Gap at 10,600' to the Little Kern watershed. Here we left the park and entered the Golden Trout Wilderness of Sequoia National Forest. Not too long after that things got ugly. A bit of background--back in the '60's when it was part of the national forest, a massive ski area was proposed in Mineral King. Public outcry prevented this, and in 1978, it was transferred by act of congress to Sequoia National Park. It became obvious that since that time the national forest has done no maintenance on the trails connecting to the park. 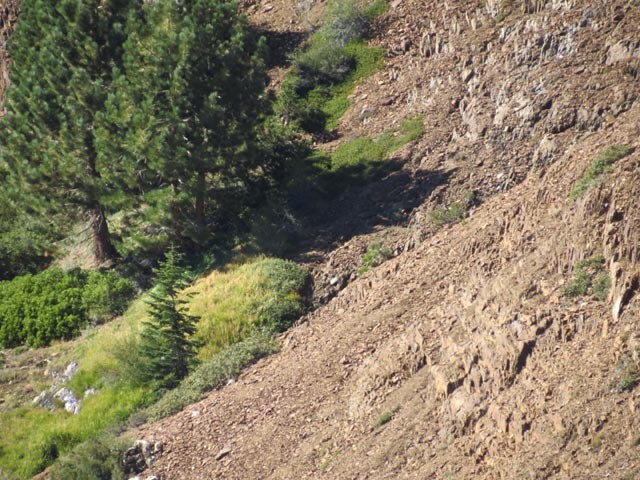 They were overgrown with manzanita and there were many deadfalls, but the worst of it were the washouts leaving deep gullies across the trail on a steep loose mountainside. We got across these slowly and with difficulty. It was clear we were not going to make it down to the Little Kern that day. Having cleared the gullies, we found a saddle with enough room for a camp, but had to fetch water from a creek about 3/4 of a mile away. The next morning we changed plans and made a day trip excursion from the camp down to the Little Kern 1500' below. We had a GPS waypoint for the branch trail down there, but it was not to be found. By following a creek down that we knew intersected it, we found it and had a relatively easy trip down and back, and we all three caught Little Kern Goldens. The next day had Coyote Pass ahead of us. It was complicated by my succumbing to an intestinal complaint. Rocky and Gary pitched in and got me and my pack over the pass, which put us back in the park with decent trails. We camped high in the headwaters of Coyote Creek. Gary and Rocky caught goldens in the creek and I concentrated on recovering. The next morning a 3000' descent down along Coyote Creek got us to the main Kern River where we camped and fished the Kern, catching some the Kern River Rainbows, another of the fish on our list. We had a thunderstorm that evening which had some consequences for our plan for the next day. That plan was to do a day trip up Golden Trout Creek. 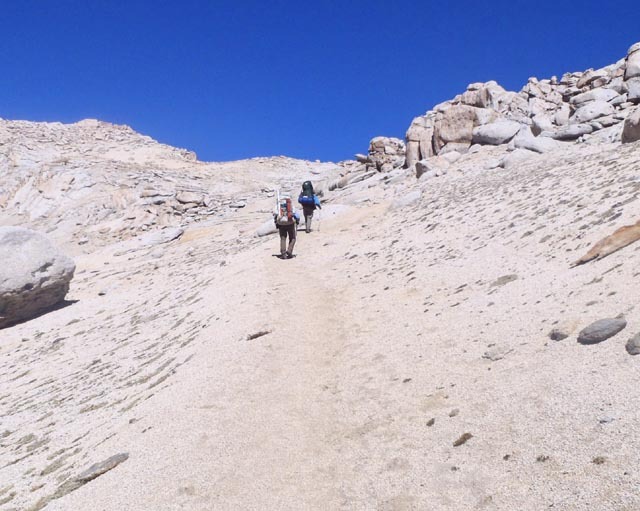 It flows over a couple of waterfalls and through a steep gully above them so a climb of 2000' up to Little Whitney Meadow was necessary to reach fishable water. find some fish. Rocky found that stripping a small black soft hackle would interest them and so we all caught a few, adding o. m. aguabonita to our list. 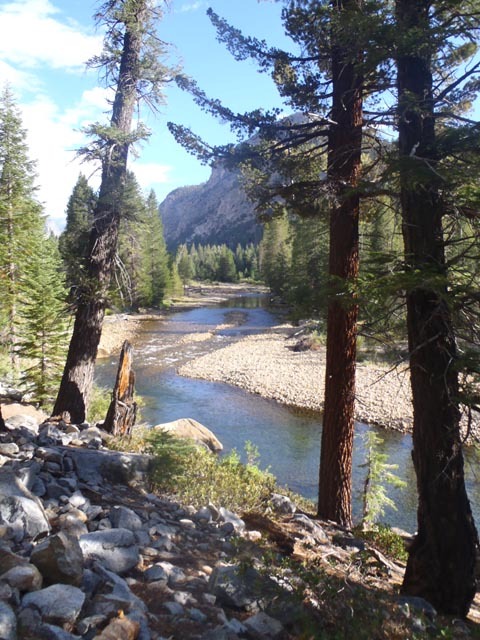 On getting back down to the Kern, we took a walk upstream a mile or so and found clear water. All the color was coming from Golden Trout Creek. At this point the fishing got rather good. 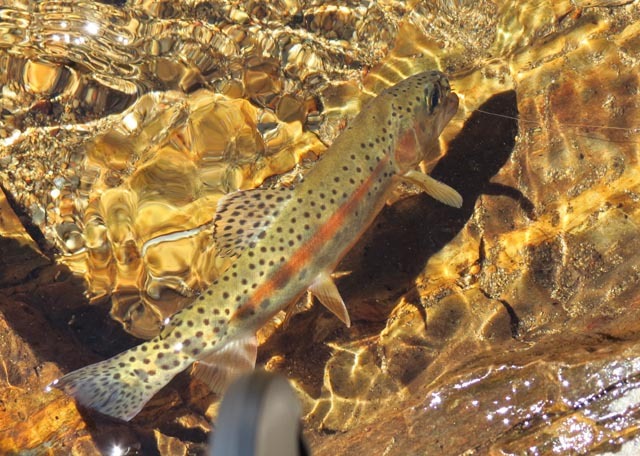 The Kern here and for some miles upstream is populated with good sized, feisty Kern River Rainbows who rose gladly to a well presented dry fly. Next morning we moved camp up river five miles to our exit trail up Rattlesnake Creek. We fished that afternoon and evening and until noon the next day, catching numerous 16 inchers and some rumored larger. Then we had to go. We were 5000' down the wrong side of Franklin Pass on the Great Western Divide. The first 1500' up from the Kern was purgatorial in the hot afternoon--the price we paid for fishing that morning. We made another 1500' before calling it quits for the day. The final 2000' through a strange desert-like landscape the next morning got us to the pass and the long descent to Mineral King. It was one of the toughest trips I have done in recent years, but a great satisfaction to this 67 year old with a metal hip joint.